Are you limited with your time? Do you always feel like going out instead of cooking at home because you are too tired at the end of the day? Well do I have a surprise for you with this simple stir-fry! It's nutritional, as well as quick, taking only 5 minutes to whip up. This meal is so good, you'll be wanting to go back for seconds. 1. Chop up chicken. 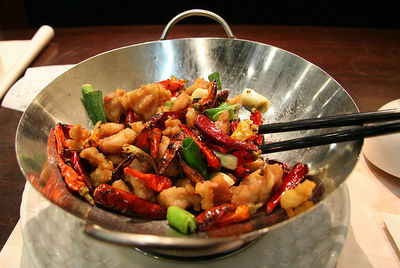 Heat oil in wok. Put ginger and garlic in. Throw in chicken and vegetables, continuously stirring. 2. Add all sauces and stir together. Leave in wok for 2 minutes to cool.